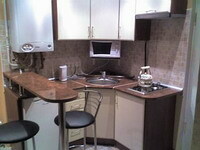 2 rooms apartment on Deribasovskaya Street located in a cosy, quiet courtyard. Cosy eurostyled apartment, authour’s design. One room has a king sized bed, the second room has a sofa which can be turned into double bed. Shower. Modern furniture and all facilities are available. There is a place for car in the yard. Apartment accommodates four guests (maximum) and equiped with: air-conditioner, washing machine, electric kettle, refrigerator, microwave oven, cooker, autonomous water supply, autonomous heating, 1 X TV, Cable TV.